From the refined Upper East Side to Brooklyn’s haphazard and hip Williamsburg, the city is teeming with jewelry creations in anticipation of spring—call it march madness for jewelry lovers, if you will. Here’s what’s hot in these two contrasting neighborhoods. Known for its easy access to Central Park, swanky townhouses and high-end shopping, NYC’s Upper East Side is the go-to location for the jewelry needs of the rich and famous. Madison Avenue is the street to stick to when browsing flagship stores of luxury designers such as Graff Diamonds, Fred Leighton, and Chopard. Front and center in the window of the Madison Avenue storefront of Chopard (709 Madison Avenue) is the Happy Diamonds Icon Pendant in 18kt rose gold, heart-shaped sapphire crystals that hold elegant free-moving diamonds, perfect for everyday wear. The brand may be getting extra attention after the recent Academy Awards ceremony, when both Best Actor and Actress in a Leading Role, Matthew McConaughey and Cate Blanchett, respectively, donned the brand’s jewels—McConaughey wore onyx cufflinks and the L.U.C. XP Tonneau timepiece, while Blanchett glittered in drop earrings, featuring opals set in white gold with diamonds. The Shop window at David Yurman (712 Madison Avenue) currently pays homage to three decades of the designer’s signature rope motif with limited edition bracelets swathed in white diamonds, black diamonds and cognac diamonds, priced for customers with deep pockets. 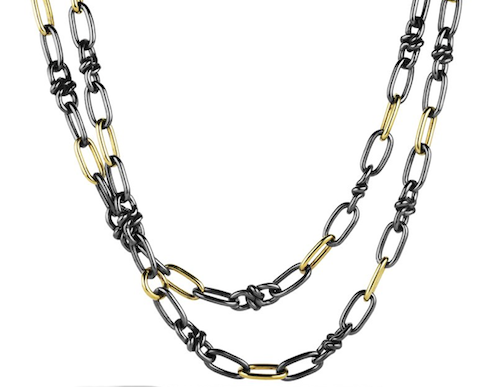 “We’ve been selling quite a few pieces from our black and gold collection, recently” explained sales associate John Banks, pointing to the Black & Gold Link Necklace. Another Upper East Side establishment known for decking out Hollywood’s elite is Fred Leighton (773 Madison Avenue). A stroll through the store this time of year will introduce shoppers to period-style jewels as well as actual vintage pieces such as the Victorian Natural Pearl and Diamond Twin Heart Bangle Bracelet, twinkling since 1860. 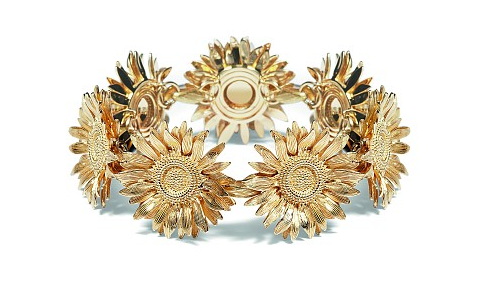 Nearby, the main US outposts of British luxury brand Asprey (853 Madison Avenue), whose claim to fame its jewels and accessories, the displays are saturated with spring foliage, such as detailed sunflower pieces in 18kt yellow gold. The set includes a brooch, stud earrings, pendant and bracelet. While many of the charms are colorful to begin with, Bries explained the current trend towards fluorescent lacquer, while pointing at tiny shoes decorated in colorful patterns. She was even surprised to note one item in particular that had been flying off of the shelves despite the team’s worry that it might be a little too funky: 18kt gold spiked and studded baby shoes in black, purple and pink lacquer adorned with a diamond bow, perfect for the little punk in one’s life. Disembarking from the L train at the first Brooklyn stop, one will find themselves a world apart in Williamsburg, best known for edgy fashion trends, specialty coffee and artisanal nosh. The latter is available in rose gold, gold, silver, sterling silver and yellow gold—enough variety to satiate the most fervent of stackers. Another popular item, the Small Arrowhead Necklace in 16kt rose gold by Hortense, displays the popular trend of using geometric shapes and features a four millimeter rose cut diamond. In Verameat (132 N. 5th Street), the Williamsburg outpost of former model designer Vera Balyura, rings are the top sellers right now, especially the Hi I’m French bulldog ring available in gold or sterling silver, and Mystery Hugs featuring eerie clawed paws reaching out to hug the ring-wearer. Also trending is a gold-brass charm with 14kt gold-plated chain in the form of a hand, reportedly modeled after one of James Dean’s. While there is certainly a lot happening behind store doors, on this sunny day, Bedford Avenue is packed with sidewalk vendors, among them several jewelry designers. Charlene Dixon (Dixonian.com) is one designer who has chosen to take to the streets. “I’ve been selling on this street for three years,” Dixon says, pointing out some of her most popular gold and silver pieces, including the Heartbeat Bracelet and matching ring.